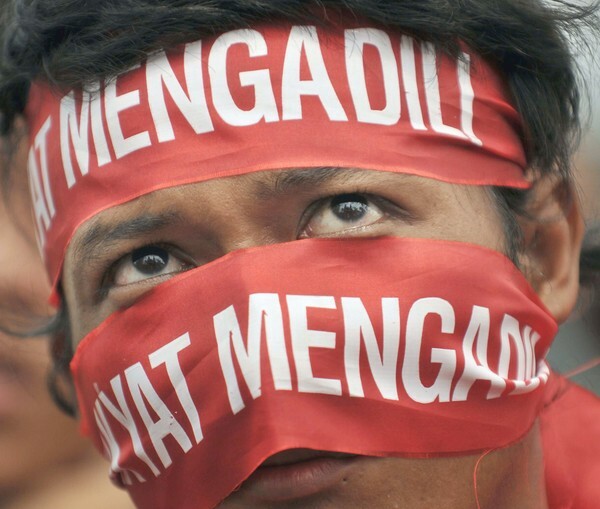 A protester has a banner around his head that reads ‘Let the people judge’ during an anti-corruption protest in front of the parliament building in Jakarta last week. Lawmakers are conducting an investigation of the government’s $730 million bailout of Bank Century in 2008, which the demonstrators opposed. Tens of thousands of pro-life activists marched in San Francisco on Saturday, January 23, for the 6th Annual Walk for Life West Coast. In Albany, New York, a rally was held on Monday over plans to allow for natural gas drilling in the Marcellus Shale in upstate New York. Critics say the drilling process known as hydraulic fracturing, or “fracking,” could contaminate the water supplies of New York City and other areas of the state. Police officers in Balochistan (Pakistan) staged a sit-in on Monday to protest the fact that their salaries haven’t been increased. The Cairo Public Transportation workers are starting a strike in all the Cairo garages, at 6am today, demanding the modernization/replacement of the obsolete buses and spare parts, raising allowances related to work hazards, increasing bonuses, reforming the health services, and calling for the formation of a free union, independent from the corrupt state-backed NDP-run Egyptian General Federation of Trade Unions. Three anti-coal activists in West Virginia have entered their fifth day of a tree-sit on Monday as part of an effort to shut down a mountaintop removal site run by the mining giant Massey Energy. The three activists are perched atop platforms on trees on Coal River Mountain. Tens of thousands of Venezuelans opposed to Hugo Chávez took to the streets of Caracas Jan. 23, blaming him for numerous problems in the country, including increased electricity blackouts, water rationing, and widespread crime. Thousands of people protested Sunday in the streets of Indian-controlled Kashmir, accusing the Indian army of killing a civilian. Pingback: It wasn’t 40,000…. it was 50,000 at San Francisco Walk for Life!